This sculpture was aÂ lot of fun to make. I worked off a sketch and exaggerated the features to emphasise the heavy bones of a typical draft horse. Then I spent a long time painting all those varieties of gray on the coat. The colors – dappled gray for the body and blond for the mane, tail and feathers, were inspired by a horse named Nina, a shire horse whose photo can be seen here. The sculpture has a slight forward lean that gives the impression of potential movement. However, it also made the sculpture slightly unstable – she wanted to fall forward because of the weight of her head. I solved this problem and gave the finished piece a satisfying weight by removing the paper from inside her back hooves and replacing it with plaster. 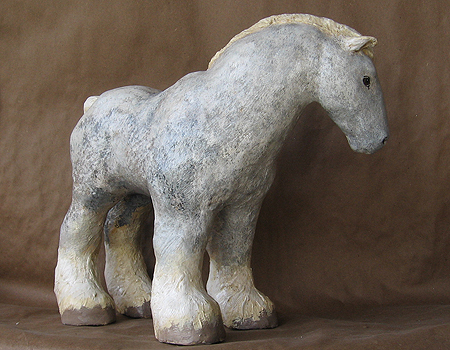 I did this after the paper mache around the hooves had hardened, but before I put any paper mache on the bottom of the hooves. Whenever plaster is used to add weight to a paper mache sculpture it’s important to put in some plastic sheeting or a plastic bag so the plaster is separated from the rest of the sculpture. If you don’t do this, the water in the plaster may slowly seep out into the paper mache, long after the plaster has become hard. 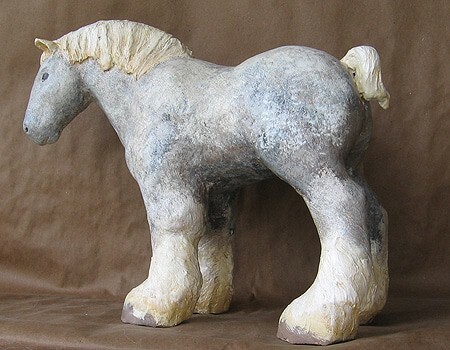 This horse sculpture is approximately 12″ high and 14″ long. I did not use a pattern to make the horse – I used the same techniques for forming the crumpled paper/masking tape armature as is shown in the dragon sculpture tutorial. Last night I was ‘strolling’ through some of your projects that I had not seen before and came across this one. I got the song stuck in my head and that was before I had watched the little video. Next I will probably be humming “Go Tell Aunt Rhoadie.” Ahhh. The classics never die. I love the strength and power of the draft horse. Wonderful piece! I need to make a large horse, small pony size, that a small man could sit on. Is this possible? I was thinking of using a wooden sawhorse as the base, putting a felt saddle on it and molding the horse from chicken wire around it. Do you have any recommendations? It is for a skit. The sawhorse is a great idea. It’s hard to make a sculpture strong enough for someone to sit on, but that would work very well. You might also want to take a look at my video showing how I built a life-sized paper mache baby elephant. It might give you some more ideas.